This chapter aims to present credit scoring as a technology meant to improve micro lending significantly. We consider that credit scoring is an advanced technology because statistical procedures, some sophisticated, are required to design powerful scorecards. In the same time, we want to show that scoring is not an elitist tool. It is not for every institution, as some prerequisites are required, but we are convinced that there is an enormous potential market for credit scoring in micro lending. Credit scoring can be efficient only in massive homogeneous markets. Microfinance usually addresses this kind of markets. This is the opportunity we want to exploit. On the other hand, quantitative measurements, required for statistical developments, suffer from the fact that micro-entrepreneurs operate mostly in the informal or semi-formal sectors. Some variables like the profit of the business or the turnover cannot be measured accurately because there is no reliable source. This is a challenge. Implementation of credit scoring and follow-up in an environment that has limited access to data infrastructure solutions could also be considered as a challenge. 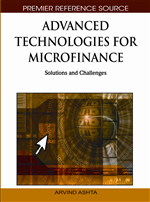 Here we describe in detail possible applications of credit scoring in micro lending. We explain main technical aspects and point expected benefits versus implementation and maintenance efforts. This chapter is written from the point of view of several scoring experts that develop credit scoring models for micro and SME lending on a commercial basis. Scoring is a methodology that offers an objective way to assess risk. It estimates the probability that an event will occur, by giving grades to known characteristics that have impact on the event. In the case of credit scoring, the forecasted event is the bad credit behavior of the client that can lead him to default. This is one of the main risks in lending: Will the client be able to repay integrally the loan and due interest on time? Bad credit behavior, called also negative credit behavior, is when the borrower registers delinquency. He fails to meet his obligations with respect to the due principal and interest. This fact has the following consequences: the institution cannot use the money it was expecting; penalties start to be calculated on the overdue amount; and the institution starts to take actions to recover the money. Short delinquencies are not dangerous for the client and for the institution, but long or frequent delinquencies are risky because they can lead the client to default. The institution risks losing the money, while the micro entrepreneur risks to lose the business that, in many cases, is the only source of income for his household. At the moment of credit approval nobody can certify that the client will repay on time and integrally the loan and due interest. In fact, nobody can certify that recovery actions undertaken by the institution, once the client in delinquency, will give any result. In these conditions the losses of the lender can be even bigger, as the institution besides lent money could invest in collection activities and have no return. This is why financial institutions require collateral, cosigners and other guaranties meant to give a possibility to recover credit amounts if clients fail to pay. But even these guaranties cannot save the institutions from losses generated by bad loans. In these conditions, credit scoring appears to be a very useful tool. That is why it is so popular, if not a must, in mainstream finance, where this technique is used not only to help approve loans but also it is widely applied in marketing, debt recovery, provisions, fraud detection and churn prevention.